It wasn’t so long ago, in 2010, when Sean Ellis coined the term “growth hacking.” He was the man most companies in the Silicon Valley turned to when they needed to scale their businesses. His services didn’t involve your run-of-the-mill marketing strategies. For each business, he created a different rulebook, armed with strategies optimized for growth—growth being the operative goal for every business. Of course, marketers like you and me have turned that corner now and realize that our marketing strategies must adapt in response to industry trends and demands. A lot has changed about the way we do business, consume products, and shape our opinions. We no longer need to visit a brick-and-mortar store to make a purchase when the same product can be delivered to our doors at competitive prices. Let’s take the case of the e-commerce sector, which is expected to rake in sales of $27 trillion in 2020. Where will your marketing strategies stand in an industry that is primed to explode? Amazon.com, the world’s largest e-retailer, was selling over 398 million different products as of January 2017. The company is known for unconventional marketing decisions that have paid off more often than not. What sets them apart, you ask? They provide products at low prices and with unparalleled delivery speed. While other e-commerce sites may allocate more funds towards branding and advertising, CEO Jeff Bezos focuses on user experience. 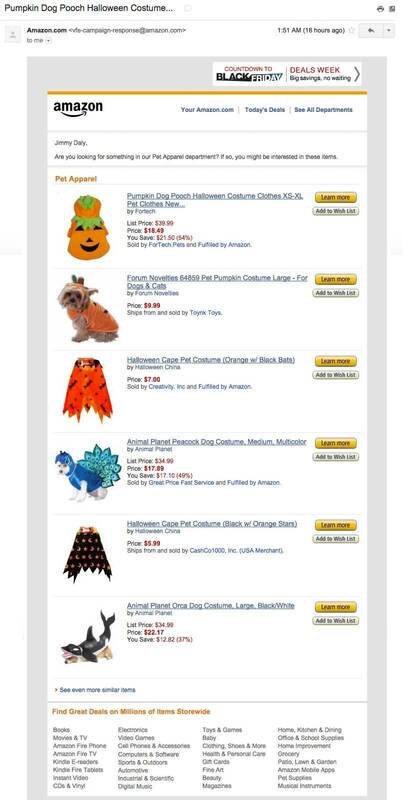 Now, you don’t need to be a behemoth like Amazon to grow your user base. If you’re an e-commerce marketer hoping to exponentially grow your user base, look no further! 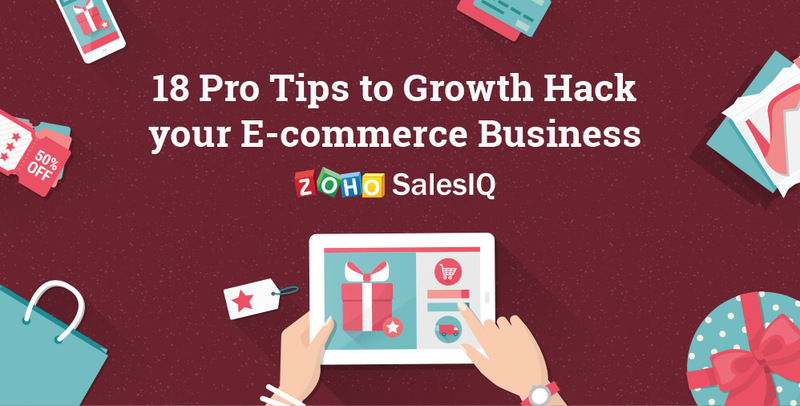 This blog includes 18 pro tips to growth hack your e-commerce business. Each growth hacking strategy will be explained in relation to e-commerce businesses like yours that used it to grow their sales and revenue. In 2015, Instagram announced that it would start targeting audiences with relevant ads, using information drawn from their Facebook accounts. By customizing the audience listing, you can send the ads most likely to pique your audience’s interests. You can further narrow down your potential customer base by demographic factors, like age, gender, and location. 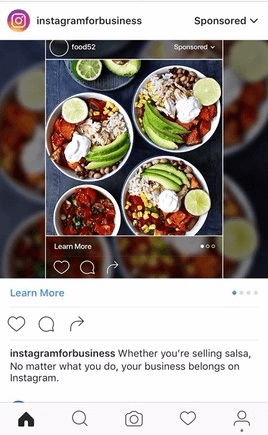 The process of setting up an Instagram ad is almost identical to that of Facebook ads. The only differences are in ad design considerations and target audience. While Facebook ads are characterized by bright graphics and the use of text, Instagram ads are largely photo-inspired and use minimal text. Moreover, Instagram has a somewhat younger user base than Facebook, which has users across age groups. This is something to keep in mind if your potential customer base is in the 18-29 age group. Food52’s Instagram ads pay attention to detail. Quality photography is their standout feature. This is backed up by informative content in the form of recipes, which you can access through the website link on their Instagram page. Food photography is hugely popular on Instagram. So it comes as no surprise that Food52 has 1.7 million followers and counting. Just how many and what combination of hashtags can make your content more visible on Twitter and Instagram? While Twitter has no limit on number of hashtags used, Instagrammers can use up to 30 hashtags. Did you know that tweets with hashtags receive twice as much engagement as those without? Use more general hashtags that have a higher following and searchability. For instance, if you want to market your online cosmetics store, you can use broad-ranging hashtags such as #makeup or #cosmetics, rather than more specific terms with lower reach. You could also leverage the trending topics suggested in your Twitter feed. ASOS, a British online fashion store, has used the trending hashtag #ootd (outfit of the day) to great effect. Overdo your hashtags and you may gain more likes, but at the expense of seeming spammy. Use them in moderation and focus first on quality content. The tags you use must be precisely targeted towards your niche audience. Twitter even suggests its users to stick to 2-3 tags per tweet. Consider using a brand hashtag that conveys your brand spirit. Ajio, an online Indian fashion store, uses their hashtag #doubtisout as part of their promotional campaigns. When organizing an event, you can live tweet it using promotional hashtags. You could also use campaign-specific hashtags that can grow in traction. 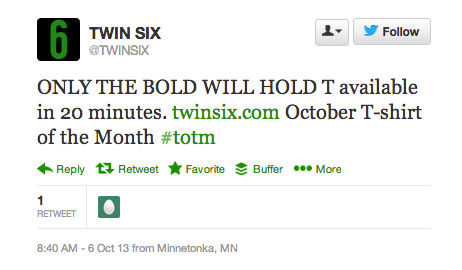 Using the hashtag #totm, Twin Six, an online sporting apparel store, promoted their T shirt of the Month campaign on their social media handles. You can connect with social media influencers who then act as your brand advocates. These online celebrities with thousands of followers can use your products and showcase them on social media platforms. They can also provide product reviews, with full details about pricing, shipping cost, and availability, on say, their Youtube channels. Such lifestyle vlogs are growing in popularity and give your product a natural showcase. Unlike traditional advertising, where you don’t have the tools to assess your ad’s success, the reach of your influencer marketing campaign can be measured in the very real terms of views and shares. Lo and Sons, an online bags and accessories store, leveraged Instagram influencers in fashion and travel to post photos of themselves carrying their bags. Whichever camp you are on in the “All marketers are storytellers” debate, setting your brand voice and image is key to establishing everything from your target audience right down to your last marketing strategy. You could post instructional or educative content like blog posts, slideshows, podcasts, or videos. This approach shows that you care about more than selling your product. Net-A-Porter, an online clothing company, releases a monthly online magazine, The Edit, that includes all the latest trends in women’s luxury fashion. You could organize social media contests with attractive prizes that are sure to garner excitement. 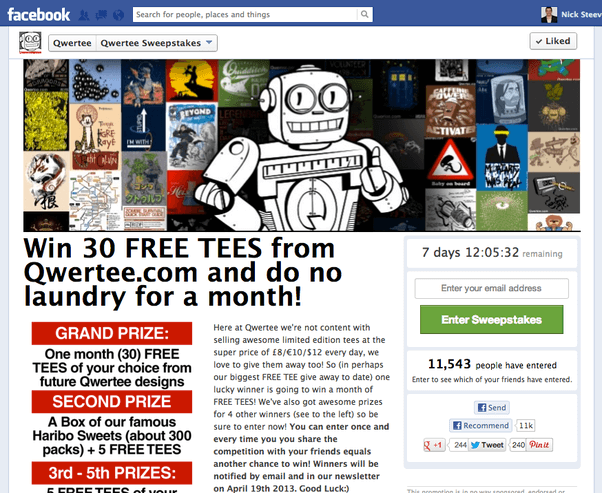 In order to reach 100,000 likes on Facebook, Qwertee ran a hugely successful contest that gave entrants a chance to win free tees by simply liking their page and submitting their email address. Take a stand by identifying with a cause that you believe in. Through Ebay’s Giving Works initiative, customers can favorite the nonprofits they want to support and make donations during checkout. Even sellers can donate a percentage of their profit towards charity. Here, cause marketing is a built-in part of Ebay’s functionality. Creating a podcast and promoting it through the right channels has never been easier. All you need is a computer, a mic, and the right platform to grow brand awareness and visibility. By creating original, high-quality content, you can establish yourself as an expert in your field, while networking with peers. What’s more, these audio digital files can help you get across those nuances of your message that might be lost if your audience were to read your content. Remember to include an effective CTA in your podcasts. Now how do you make sure your podcast reaches the maximum number of listeners? You could upload it to the iTunes store, which has over 800 million users who tune in for new content. You could also do guest podcasts that lend you instant visibility to a wider audience. If you invite someone to do a guest podcast on your channel, they’ll want to link back to you so that their audience can view their guest post. That’s a win-win if there ever was one. To ensure that your latest podcast is picked up by iTunes and Google Play immediately, update its title in your RSS feed. There’s also no harm in resharing your podcast on social media. Tools like Meet Edgar and Agora Pulse will automatically reshare your content on social media based on the schedule you set. EcommerceFuel Podcast, hosted by Andrew Youderian, is one of the standout podcasts, discussing new e commerce-related topics that are posted daily, and bringing together e-commerce owners from around the world. Did you know that over 70% of customers will not proceed with a transaction if they don’t trust an e-commerce website? Your site must provide reassurance that you’re an authentic brand. Make sure your website design is sleek and user-friendly. Add easily accessible links, like Contact, About Us, Categories, and Payment Options. You don’t want your customers to doubt your legitimacy. You might also consider using logos of brands that trust you or have worked in collaboration with you. Add customer reviews, which complement these seals and prove your commitment to maintaining industry standards. To ensure that payment gateways are secure, use SSL or TLS protocols to provide authentication and encrypt the information relayed on your site, such as your customers’ credit card details. According to research conducted by UXMatters, icons such as PayPal, VeriSign, and Visa are some of the most highly trusted seals that first-time visitors rely on when choosing to purchase a product. Zappos, an online fashion store uses the logos of Business Week, Visa and Mastercard as trust badges on its website. Through A/B testing, you can assess how different value propositions can have different impacts on sales. While the original landing page is your Control page, the page with the new feature being tested is the Variation page. You can use A/B Testing to see how efficient your checkout process is. Ideally, your customers should have to complete the least number of steps to finish a transaction and get the product in hand. Remember to test out one different feature at a time so that results aren’t skewed. Use it constantly to test the outcome of different variables. Some of the features to test are product image size, description, banner ads, layout, payment and delivery options. It can be something as simple as the color of the sign-in button or the greeting you use to address visitors. You’ll learn the customer pain points and conversion points on your site and where exactly you tend to lose them during the transaction. Platforms like Optimizely can help you experiment with different variables and personalize your website. 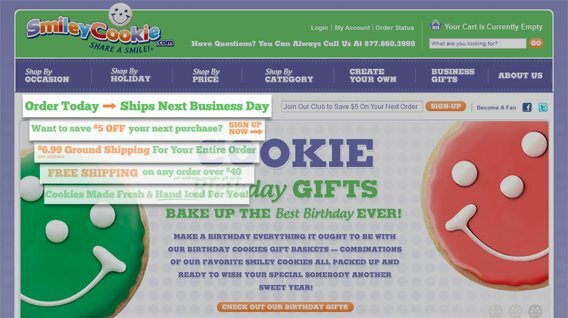 SmileyCookie, an online cookie store, used A/B testing to test out five different options. Their findings revealed the next-day shipping proposition as being the most actionable. It led to an incredible 41% increase in sales. Mall.cz, an e- retailer providing a range of products, used A/B testing to see if larger product images would impact sales. The results revealed that larger product images trumped product details and led to a 9.46% increase in revenue. Boost your sales by shooting out emails to your subscribers. Simple enough, right? Yes and no. While email marketing can be done at a fraction of the cost of your other marketing efforts, you must make sure that you address your customers’ needs first and provide them with a personalized message that will hold their attention. Remember that you’re creating a lasting relationship with your customer. Take the time to empathize with them and address their concerns through your email marketing efforts. Email goes hand-in-hand with content marketing and you mustn’t forget to leverage that. Provide a quiz of sorts that customers can answer. Following this, send only relevant or customized emails that consider their preferences as a buyer. Through such targeted mails, you present your potential customer only with those ads and deals most likely to interest them. You’ll have a higher chance of conversions and you won’t bombard them with unnecessary mail. Win-win-win! Some of the email campaigns you might run are abandoned cart emails, promotional offer emails, loyalty program notifications, and welcome emails for new members. Once again, use a well- positioned (the earlier, the better) and effective CTA in your mail. Use email content that’s strong and well-tested, and a subject line that engages your audience. Make sure your content is mobile-friendly, ie; that it loads smoothly across devices. You can also keep track of key metrics with tools like MailChimp, which provides analytical information about your email marketing efforts. Other email marketing platforms to try are Remarkety, Emma, and Klaviyo. Through their abandoned cart email campaign, Enjuku Racing, an online retailer of automobile parts, recovered more than $425,000 in their first eight months. Co-host a show that promotes both your brand and your partner’s brand. Link back to your partner’s brand on your website and let him do the same for you. These are just some of the ways you can harness piggyback marketing to your benefit. By partnering with those e-commerce brands that aren’t in direct competition with you, but are complementary to your business, you can increase your customer base without having to pay the additional costs incurred through other marketing strategies. 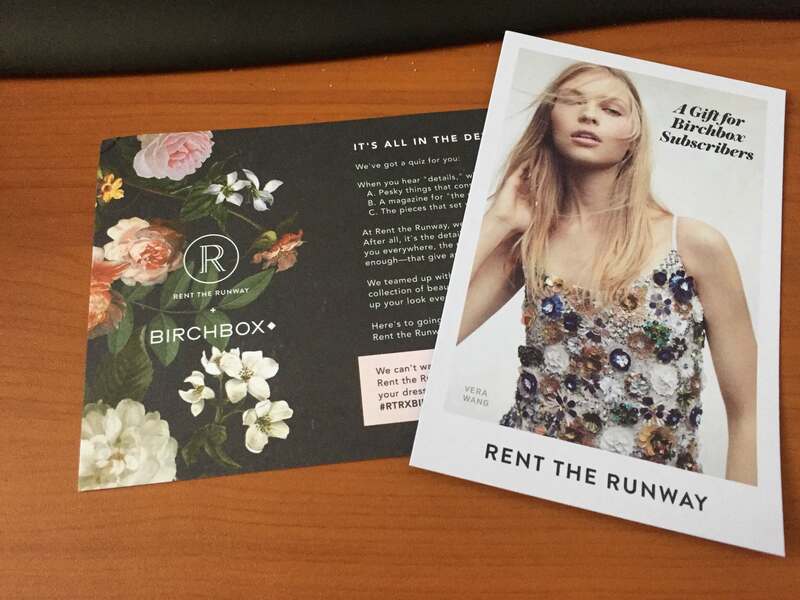 In their partnership, Birchbox and Rent the Runway, both of which are online fashion and makeup retailers with similar target audiences, provided all Birchbox subscribers with a value-add from Rent the Runway. Because they aren’t direct competitors in terms of products, but have a similar niche audience, both stood to gain from the partnership. We’ve all come across some form of “viral” content online. How can you make sure that your content gains traction the same way? 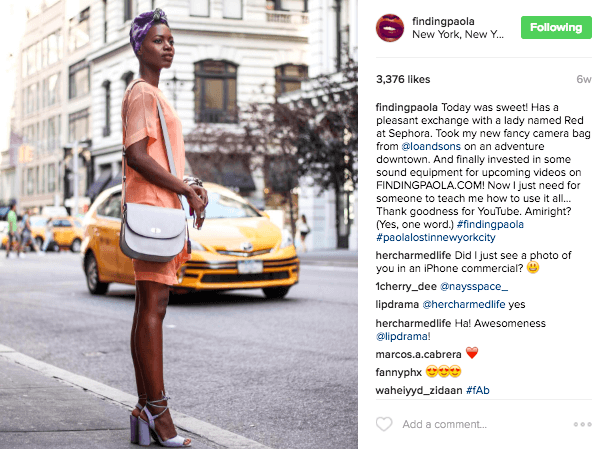 How can you use existing social media platforms to spread the word about your brand? There are many ways to create a buzz about your product. According to research by Professor Jonah Berger, viral content is usually one of five things: surprising, interesting, intense, positive, or actionable. You may not create viral content on your first attempt. But you can consider organizing a giveaway or a contest that celebrates your brand. What’s more, as your brand gains in traction, your customers will do your marketing for you, by showcasing your products. Getting your customers to speak about your brand can also be a built-in part of your website’s functioning. 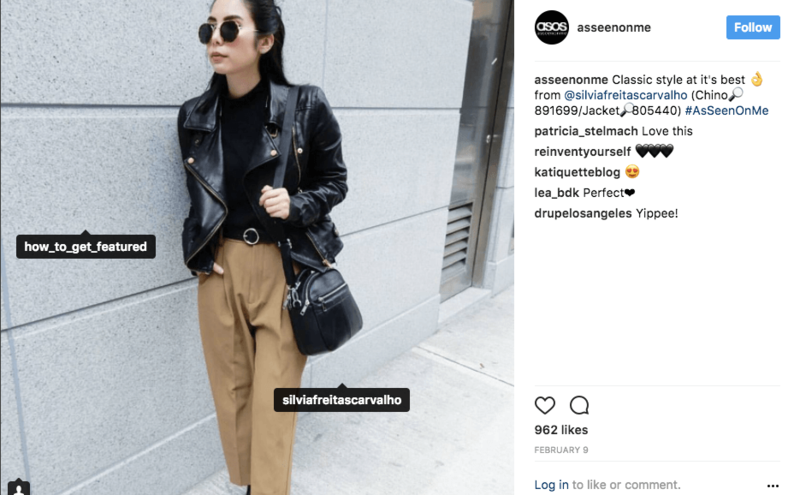 ASOS, an online British fashion company has gained in traction following the use of the hashtag #AsSeenOnMe. Customers wearing their ASOS look can use the hashtag to get featured on the ASOS page. At some point in time, we’ve all implemented videos as part of our marketing strategy. Did you know that Forbes declared 2017 the year of video marketing? Videos are some of the most highly searchable online content. If you use the right keywords in your video title and description, you can optimize them to appear earlier during search. Make sure that they can be shared across social media platforms, and don’t forget to provide an embed option. How- to videos are among the most searched, but that doesn’t mean that fresh content won’t win. Be creative and open to experimentation. Engage with your audience and let your video do the talking. All of your marketing efforts must be an extension of your brand image, and video is no different. At just 60 seconds, Man Crate’s video ad is humorous, in line with their brand image, and creates suspense for an audience that’s curious to know what’s in their crates. According to research conducted by Facebook, shorter videos will more often be watched to completion, while longer ones may frustrate viewers. The objective here is to clinch your audience’s attention with a 15-second GIF ad. GIFs are far more interactive than still images, and they make your product more memorable. Moreover, they’re compatible with social media platforms like Facebook and Twitter. They help elicit a very specific reaction in your viewer, something that pictures are just not capable of doing. Remember, GIFs are highly context-specific. Use them well and you just might have a winner! Now that Facebook is supporting GIF ads, they’ve become a very popular medium for advertisers. Online furniture retailer Made.com used the trend to their advantage. Their free delivery surprise notification uses simple colors and some GIF action that is sure to catch your eye. While we’re on the topic of interactive ads and engaging content, let’s discuss the “gamification” of ads in recent times. According to a Celtra report, gamified ads have a click through rate of 28.8%, well over the 3.9% of non-gamified ads. You could gamify the shopping or the sign-up process. While a game format may be hard to resist, nobody likes to lose! So make sure to keep it uncomplicated. You could also add incentives, such as reward points for top players. In collaboration with design network Notcot, Bonobos, a leading men’s fashion e-retailer, began an Easter-egg hunt campaign. 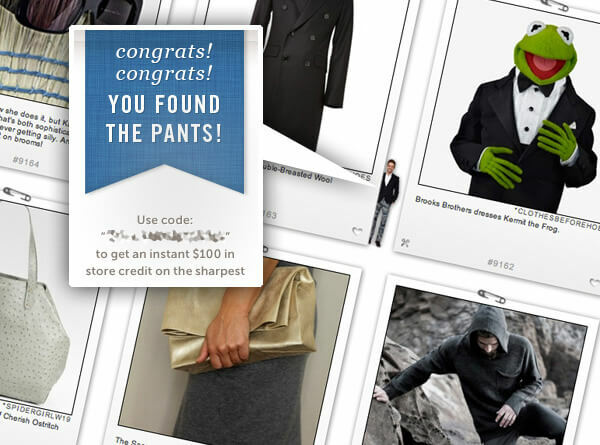 The first 50 Notcot visitors who could spot hidden models dressed in Bonobos’ signature pants won $25 credit, plus free shipping, courtesy of Bonobos. We’ve all clicked through friends’ photo stories on our Instagram, Snapchat, and Facebook accounts. They’re quick and concise, and they disappear in 24 hours. As marketers, we can leverage this feature as just that—a story-sharing platform. If you use photo stories creatively, they can act as a status update about your latest deals or fresh arrivals. You can use them to offer product sneak peeks, or to create suspense around your latest product launch. Military Apparel Company, an online fashion and accessories store, used Instagram stories to promote their giveaway offer. 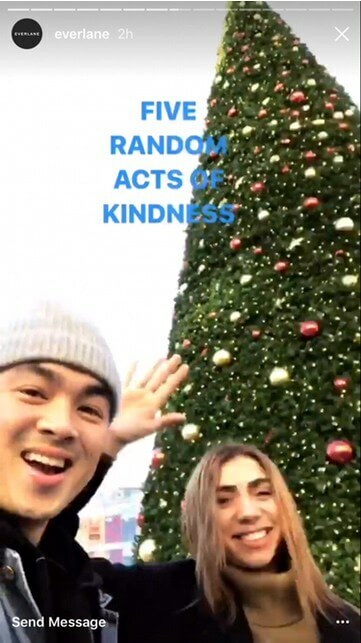 Everlane, an online clothing store, used Instagram Stories during Christmas.Their social media team performed random acts of kindness for strangers. They then challenged followers to do the same and tag @Everlane in their Insta-story. Who doesn’t love free merch? Think back to the last time you received free merchandise or earned a few more reward points to your credit. How did that make you feel towards the brand? Rewarding customer loyalty is one marketing practice that you shouldn’t forego. It’s a customer retention tool that builds trust and opens up a pathway for further transactions to take place. Loyalty programs could include anything from discount coupons and exclusive offers to early access to sales and the latest products. Many brands also use a referral program, providing discounts when the customer refers the brand to their network of friends. Here’s a pro tip: Make customer referral a built-in process of your site’s functioning. For instance, you could invite your customers to provide brand referral when they log in. Remember to test your loyalty program to see whether it’s effective. Make sure to provide unique rewards, while keeping the process simple. Most loyalty programs are either tier- based, where customers can move from one tier of privileges to the next, or point- based, where they earn extra points with each new purchase. Analyze your program to see where you tend to lose customer interest. Target these areas and ensure that the rewards offered are of interest to your customer. 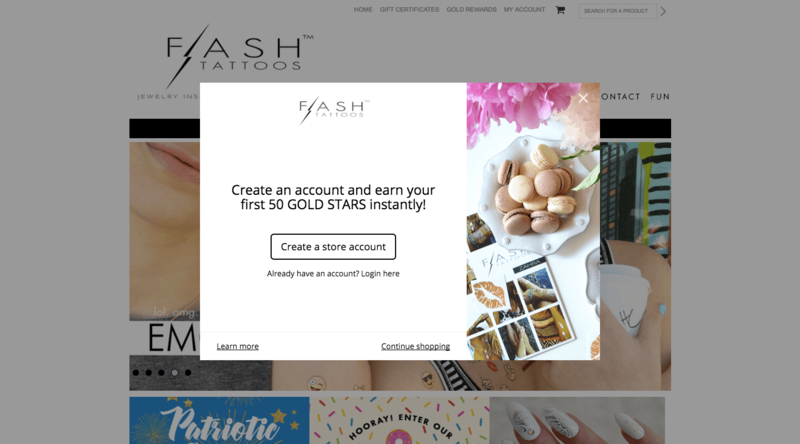 Flash Tattoos’ Gold Rewards program is simple and effective. For each dollar that you spend, you earn 1 gold star. They provide a credit of $5 for every 200 gold stars earned. When customers follow them on Twitter and Instagram, or refer them to friends, it also adds to their gold star rewards. GILT, an online lifestyle store, provides a tiered loyalty program. Customers are encouraged to move to the next tier with additional benefits like early access to sales and the first pick of new arrivals. I’m sure you’ve seen this phrase at some point during your e-shopping experience: “Customers who bought this product also bought…” It’s usually found under a section called “Recommended or related products.” Upselling and cross-selling are common marketing practices that you can use to boost sales. Try to personalize messages like these so that you don’t appear too pushy. Such product recommendations stand out as well-researched suggestions. Give genuinely relevant and useful data in your upsell. Your product recommendations should take into consideration your customer’s buying history so that you present them with the products that they are most likely to buy. There are a number of tools you can access online that provide algorithmic data to back upsell and cross-sell suggestions. 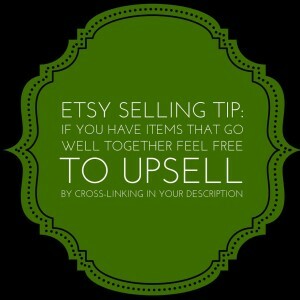 Online retailer Etsy provides upsell options even after the transaction is made. It shows you more items you might be interested in, some of which are products you’ve already viewed. Your customer may have added products to their wishlist, or may have added them to the shopping cart without proceeding to checkout. This might be because they want to wait for a discounted price, or due to unexpected shipping charges. Or they could be browsing for similar products on other sites. Send them a creative reminder letting them know about upcoming discounts or related products. You could also offer assistance in helping them buy the right product through live chat or email. 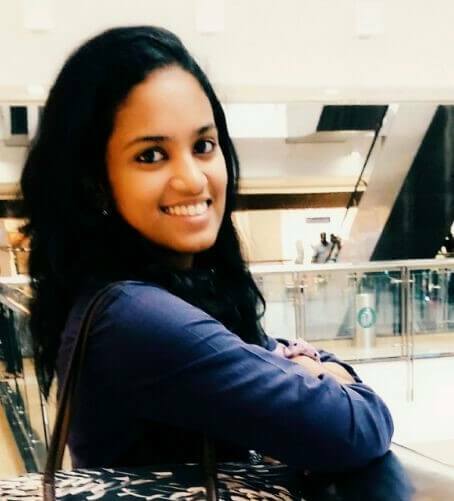 E-commerce portals like Amazon and Flipkart show popups of products customers have added to their wishlist or cart, sometimes notifying them of price drops that are available. 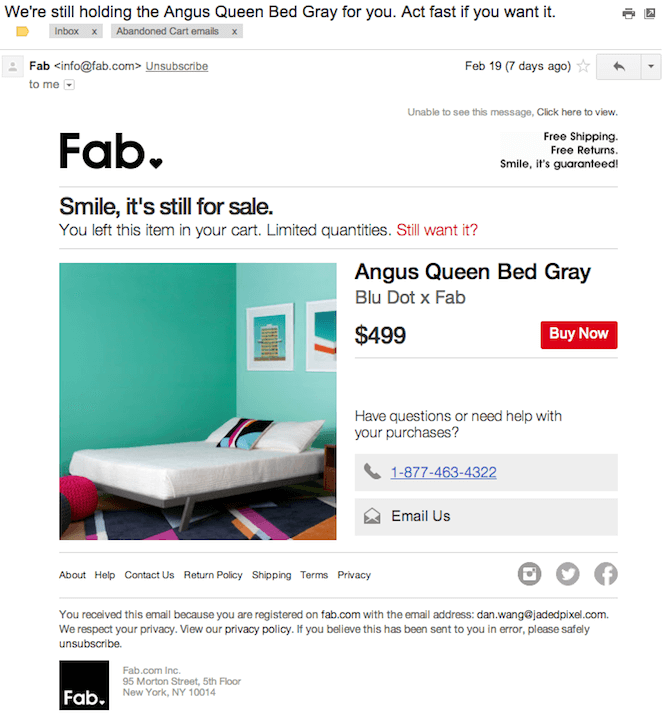 This abandoned cart email sent by Fab reminds its customers that the product they looked up is still on sale and is in limited quantity. How many times have you ordered a product because of a message like, “Only 2 left in stock. Order now”? This message informs the customer that the product is in limited stock and provides a sense of emergency. 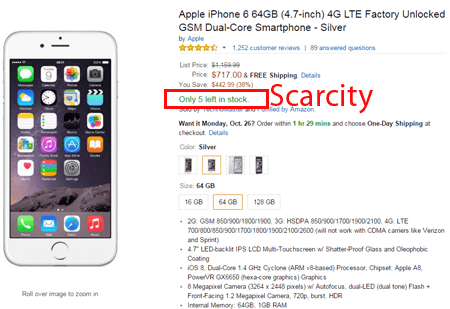 It works on the simple principle of creating demand by creating scarcity. Some e-commerce websites use a countdown timer during flash sales to heighten this sense of urgency. While this may help you bring in more sales, it may also turn off customers. A more subtle messaging will work just as well. E-commerce portals like Amazon do this all the time. We’ve already discussed the ways a customer testimonial can positively impact new visitors’ impressions of your website. It lends authenticity to your brand, much like a trust seal, and complements your promise to deliver quality products and services. Millennial shoppers have quick access to product reviews and videos. Actual customer testimonials appeal more to them than sponsored ads. What’s more, these testimonials act as free promotional content that you can link back to. Provide links to customer reviews on your product page, or even include them in your ad copy. 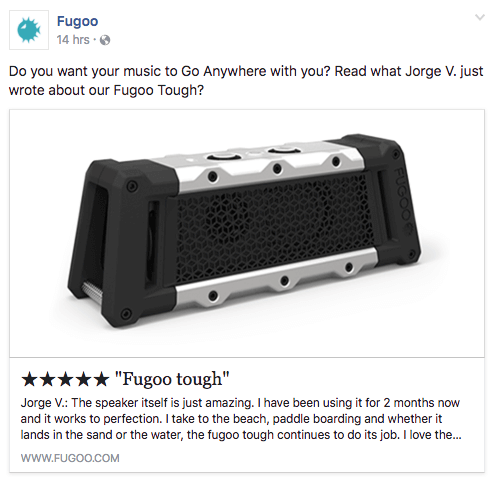 Fugoo, an online retailer of speakers and other electronic accessories, did just that, using customer testimonials as part of their Facebook ad’s copy. Now that we’ve discussed growth hacking tips in action, remember that staying present is just as important. And no, we don’t mean the Buddhist philosophy of being mindful and present. We advocate building and managing a strong online presence that ensures visibility. Join forums such as Quora, Slideshare, Reddit, etc., and become part of online blogging communities. Through active participation and engagement with peers, you could become the game changer that shapes opinions and sets market standards. This is very useful as it helped in my blog http://allguideto.blogspot.com. Is very informative and has all the points every marketer needs. Hiya, I am really glad I’ve found this information. Nowadays bloggers publish just about gossip and net stuff and this is really irritating. A good site with interesting content, that is what I need. Thank you for making this web-site, and I’ll be visiting again.